Page rank checker, a new website in the PageRank marketing services arena, has launched its website, http://www.PageRankChecker.info, which will help consumers measure their page ranking in top search engine websites such as Google, Bing, and Yahoo. Page rank checker, a new website in the PageRank marketing services arena, has launched its website, PageRankChecker.info, which will help consumers measure their page ranking in top search engine websites such as Google, Bing, and Yahoo. The company announced the launch earlier this month and they are pleased this website is finally available as a free tool to assist businesses and individuals in their endeavors to get a higher ranking in search engines. For website owners and managers, PageRank has a direct effect on sales and clickthru rates. By understanding where a page stands within search engines, website owners can create a better plan of action for offline and online marketing that can give an increase in sales and a consistent flow of traffic. A tool as useful as pagerankchecker.info is vital to website owners planning their next marketing step. 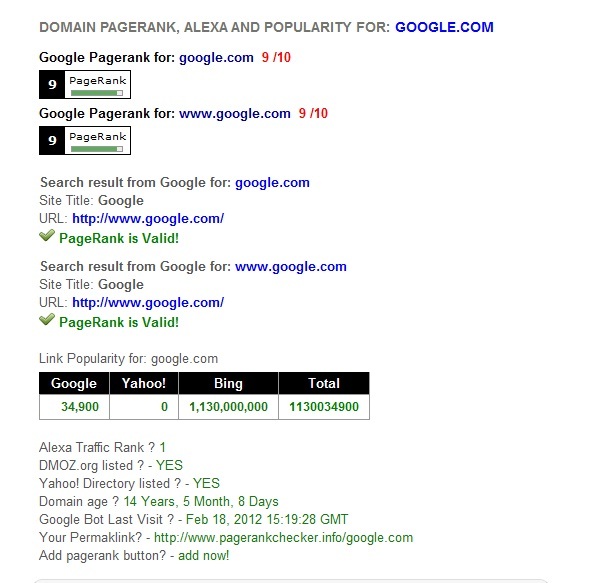 Pagerankchecker.info does not simply tell consumers where they page is, but it gives useful data on how long the website has been online, it’s ratio within the page ranking hierarchy, and selected back link information from DMOZ.org as well as the last time that a Google bot went through the website. This type of information can help consumers know where and when they need to update their website in order to achieve a higher page ranking. For more info about page rank checker, visit http://www.pagerankchecker.info.